I got off track with my Index Card A Day. General living has a way of rearing it's ugly head in my life a lot. In consequence I have decided to strike off on my own and not always go by the prompts and themes. I have a card marinating in coffee grounds which was one of supplies suggested to use for Week #5 so there will be an index card coming in the next few days using that card. 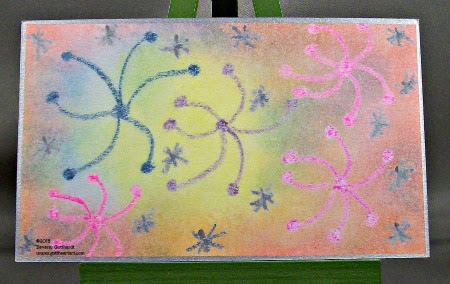 Today I've created this card using neon crayons, distress inks, and a silver Sharpie marker to created this Index Card that I've titled Fireworks. I've decided to just make cards with whatever the whim takes me using some of the wonderful art supplies, inks, and stamps that I have accumulated over the years. Thanks for visiting and leaving comments, all are appreciated.